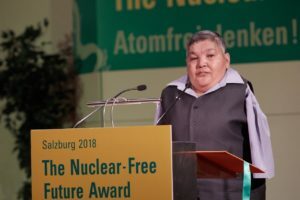 SALZBURG – The ATOM Project Honorary Ambassador Karipbek Kuyukov received during an Oct. 24 ceremony in Salzburg, Austria the 2018 Nuclear-Free Future Award (NFFA) in the education category for his contribution to the global non-proliferation effort. Kuyukov is among more than 1.5 million Kazakhs impacted by more than 450 nuclear weapons tests conducted by the Soviet Union at the Semipalatinsk nuclear test site in what is now Kazakhstan. He was born without arms as a result of his parents’ exposure to those tests. He has since become a renowned artist and internationally recognised nuclear disarmament activist who has devoted his art to capturing the images of nuclear weapons testing victims and his life’s work to ending the nuclear weapons threat. He participated in the early days of the global non-proliferation movement, has spoken at major international institutions, such as the United Nations General Assembly in New York and the UN Office at Geneva, the Organisation for the Prohibition of Chemical Weapons in The Hague and the Carnegie Endowment for International Peace in Washington, DC, among others. Kuyukov has also addressed international conferences and worked alongside victims in the United States and Japan. “I am honoured to receive this award. I accept this award also on behalf of the countless activists who have spent decades seeking a nuclear weapons-free world and a permanent end to nuclear weapons testing. I want to thank my home country Kazakhstan, and its President Nursultan Nazarbayev for initiating The ATOM Project and the project itself for providing me an international platform to seek a world free of nuclear weapons,” Kuyukov said. The ATOM Project, an acronym for “Abolish Testing. Our Mission,” is an international effort launched in 2012 to permanently end nuclear weapons testing and seek elimination of all nuclear weapons. More than 310,000 people around the world have signed the project’s online petition. Since 1998, NFFA has presented annually three cash prizes and two honorary awards to anti-nuclear activists, organisations and communities who contribute to educating the public and policy makers about the risks and impact of nuclear weapons, as well as advocating for policy change in favour of sustainable alternatives. Additional winners of this year’s awards in other categories included activists from Austria and France, as well as Australia, the United States. Photojournalist from Kazakhstan Yuri Kuydin is also a previous winner of the award. The day after the award ceremony on Oct. 25 an international symposium was also held to familiarise the general public with the award winners’ work.